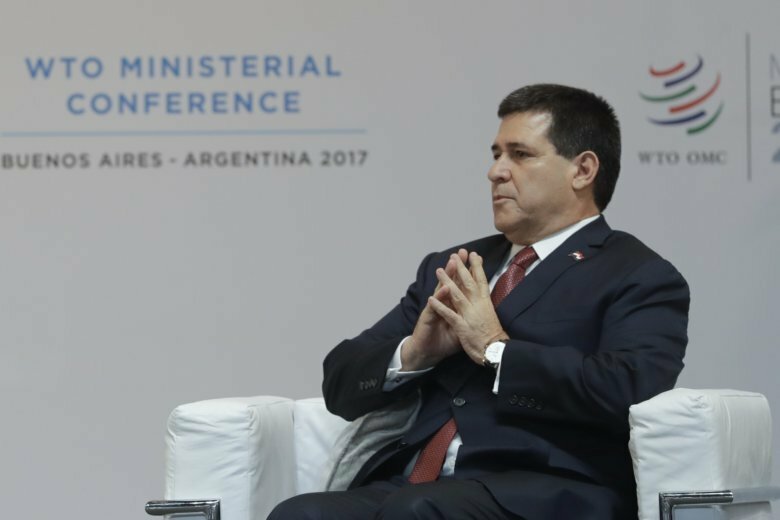 ASUNCION, Paraguay (AP) — Paraguay’s President Horacio Cartes said Tuesday he was withdrawing his resignation, signaling at least temporary defeat in his effort to take a full Senate seat and extend his influence — and perhaps legal protections — after his term ends in August. Cartes made the announcement in a tweet, expressing frustration that he’d been unable to get enough Senate votes to approve the resignation that would allow him to take up the Senate seat by the June 30 deadline, about six weeks before his presidential term ends. The country’s constitution forbids officials to hold two offices at once. Both opposition parties and dissident members of Cartes’ own Colorado Party blocked his attempt to resign. Suspicions about Cartes’s business operations became widely reported after WikiLeaks published a 2010 U.S. State Department cable that labeled him the head of a drug trafficking and money laundering operation, something he has denied. Paraguay’s constitution gives Cartes and other ex-presidents an honorary Senate seat, but that is a non-voting post that many legal experts say does not carry immunity.